Here are some items you shouldn’t wash in your dishwasher. Disposable aluminum tops this list. Disposable aluminum rusts, leaving black residue on the item you’re washing and possibly the surrounding items. Instead, hand wash disposable aluminum pie plates and serving the. 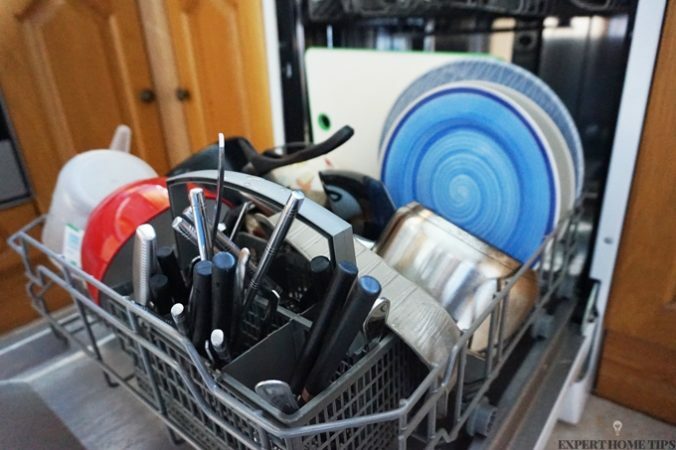 Anodized aluminum and cast iron cookware don’t fare well in the dishwasher because dishwasher detergent erodes the seasoned coatings on these items. Dishwashers can harm certain china or stoneware not marked dishwasher-safe. Check the label before placing decorative dishes in the dishwasher. Leaded crystal can etch quickly when you wash it in the dishwasher. Certain flatware shouldn’t go in the dishwasher either. If you want to keep that nice shiny finish on your gold flatware, wash it by hand to avoid permanent damage from dishwasher detergent. Knives that use adhesive to attach the handle to the blade also shouldn’t go into the dishwasher. The detergent and high water temperatures can erode the glue, causing the handle to eventually fall off. Many people who have high-quality knives prefer to wash them by hand, so the blade doesn’t get dull by bumping into other utensils. It’s best to wash pewter, brass, bronze, copper and tin items by hand because dishwasher detergent can oxidize or permanently change the color of their finishes. Check the label on all unusual items that you’re thinking about washing in the dishwasher to make sure they’re dishwasher safe. Finally, don’t put wooden cookware or utensils in the dishwasher because high heat, water and steam can cause wood to warp and split.